As an American father of two, lessons of tolerance, cooperation and respect are extremely important to pass along to my children. As they begin school in a new part of the world —Macedonia—these values are particularly important to the future of my children and their classmates. Tension between ethnic Albanians and Macedonians continues to linger after years of hostility, including an armed conflict in 2001. As a consequence, children of both ethnicities often refuse to interact with one another, in imitation of their elders. To help bridge ethnic dives and foster a culture of tolerance and acceptance, USAID has worked with local partners in Macedonia for the past 15 years to provide access to quality education for all children. American men and women in uniform have worked tirelessly alongside USAID to ensure that children around the world enjoy the benefits of stable and peaceful societies. 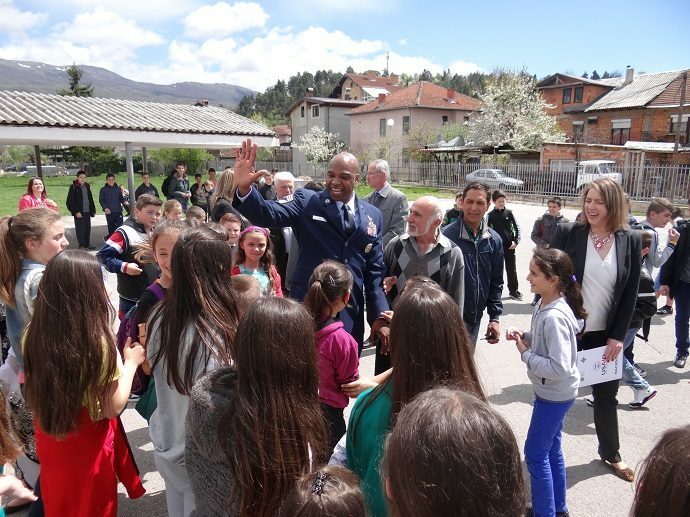 In Macedonia, we collaborated with the U.S. European Command (USEUCOM) to implement the Interethnic Integration in Education Project (IIEP) in local schools. The program builds awareness and diversity appreciation, provides training to engage ethnically diverse teachers and students, and incorporates interethnic integration into curricula. 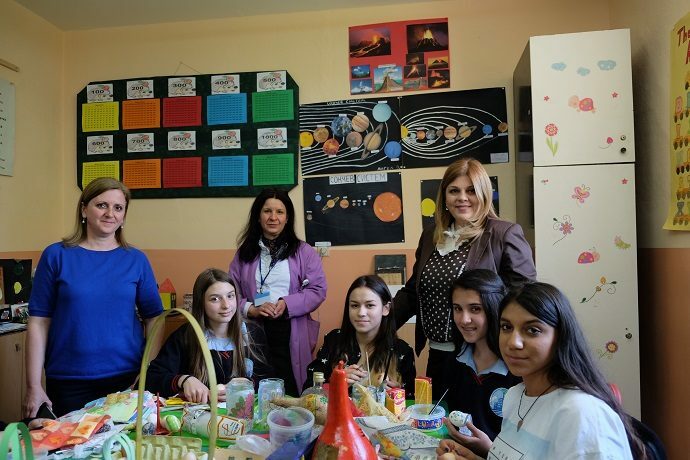 Ethnic Albanian and Macedonian students, teachers and school principal take a break during a joint art project in preparation for the Easter holiday in the primary school “Naum Ohridski” in Skopje, Macedonia. A key element of the Office of Defense Cooperation (ODC) Humanitarian Assistance program in Macedonia is fostering integration among youth. The Department of Defense (DOD) partnered with USAID for the fifth and final phase of IIEP. Backed by a $1.5 million commitment from the USEUCOM, IIEP refurbished and improved over 60 primary and secondary schools throughout Macedonia, serving approximately 45,000 students. Initial phases of IIEP focused on awareness building, diversity appreciation training and providing incentives to schools for incorporating interethnic integration into curriculums. It will take much more work to break down stereotypes passed on by older generations. Despite positive changes in the classroom, ethnic divisions remain in the education system and some curricula continue to perpetuate harmful stereotypes. What I’ve seen, however, is that the children hold an incredible power to serve as role models for peace and tolerance in Macedonia. Inclusive programs like IIEP allow youth to play a prominent role in preventing Macedonian society from becoming increasingly polarized. That is why USAID will continue its cooperation with the ODC in Macedonia and pursue another school renovation project to IIEP in 2017. The new project will help students cultivate civic awareness and adopt behaviors that teach them to work together regardless of differences. As a father and a representative of the United States European Command, I am proud of this project and will continue to work with local partners in helping to break down the ethnic divides, one school at a time. Read more about how USAID is working with the U.S. military to promote stability in Macedonia. Learn more on our work with U.S. Government agencies and military.